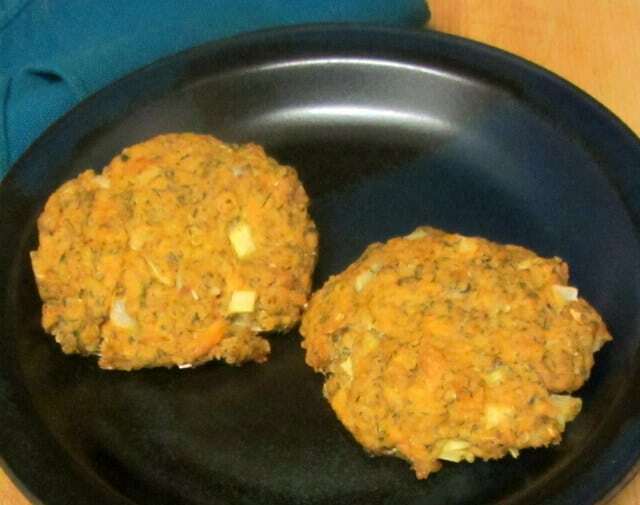 Salmon patties (salmon cakes, salmon burgers) are a pretty common, basic American dish. 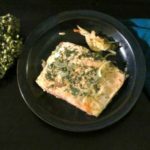 You take the readily available can of salmon – a good pantry item – and add an egg and some kind of breading to hold it together, season it, and either pan fry or bake it. Leftovers reheat well, and aren’t bad cold, so they work in lunchboxes. All together, good for a range of needs – from “I didn’t get to the store” to “Sure he can stay for dinner!” And some people who don’t like other fish do like these. Bread crumbs. Well, now I need to find a substitution for them anyway… I’d used oatmeal in meatloaf and the like, but that doesn’t work for me any more, either. 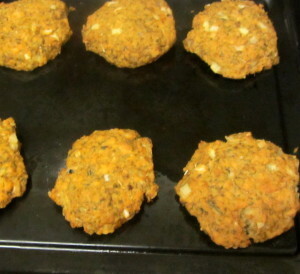 I decided that I’d rather experiment with salmon patties, since I didn’t have a firm idea of what they Should taste like… and could just see if various subs worked or not. The recipe is easy enough. I opened the can of salmon, and put it in a bowl. 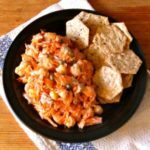 I use canned salmon rather than fresh, because the canned is wild caught Alaska salmon, and the fresh is farmed… and there are issues with farmed salmon. (Some fish – tilapia and catfish, for instance, can be farmed without problems. Salmon, though…) I can sometimes get frozen wild caught Pacific salmon, but for this, canned is fine. Once everything was added, I stirred it in very well, wanting a consistent texture and flavor. 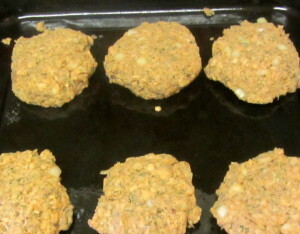 Then I formed patties and placed them on an oiled baking pan. Then I put them in a preheated oven and baked at 350° for half an hour. When I took them out of the oven, I let them rest a few minutes. Baking worked well, though it didn’t give me the crunchy bits that frying would. I was willing to take the tradeoff for ease – I made these for lunch, so being able to just stir a few things together then bake them was ideal. I made 6 patties – ate some then, microwaved 2 that night for Rich when he got home late and hungry (He’d had dinner, sort of… but…) They reheated quite nicely. We ate them plain, but a touch of tartar sauce, remoulade sauce, or dill mixed in yogurt would have been a nice touch. 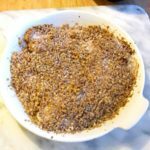 It would be easy to double or triple the recipe, for more people, of course, but also to have some to pack in lunches or have on hand for a super quick meal. I think the quinoa worked nicely – they were tender and moist, not bready (as an earlier version had been) but didn’t fall apart, either. The salmon flavor came through clearly. 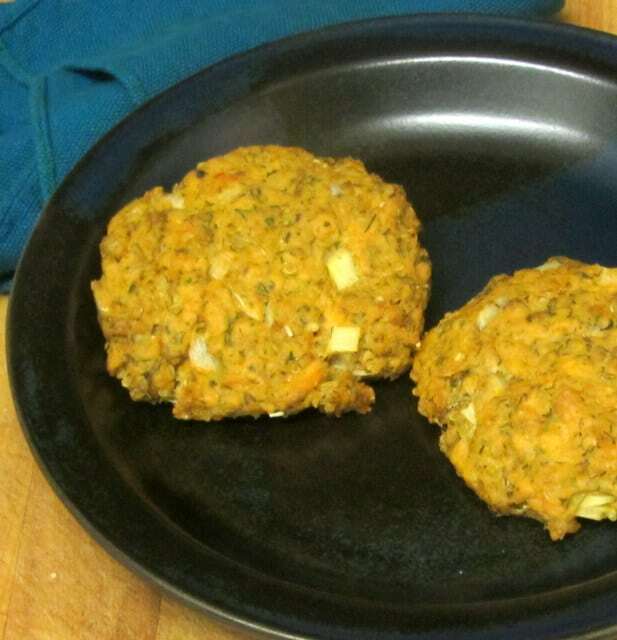 I will definitely double this recipe and freeze the baked patties, for an easy and quick meal on a long day. 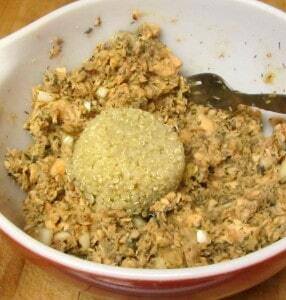 Bake gluten free salmon patties with quinoa, for a quick and easy meal from foods you can always have on hand. 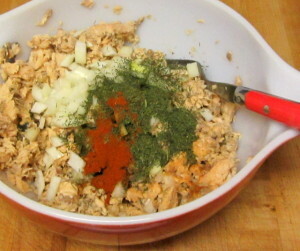 Place salmon in a mixing bowl. Remove bones if desired, or else break them up well. Flake the fish. Add all other ingredients, stirring well. Form 6 patties. Place on a greased baking sheet. Bake at 350 for half an hour. Let rest for five minutes, then serve. Interesting recipe. I make salmon patties (and also lamb or grass-fed beef patties) about like that but I have been using rice flour, the quinoa sounds a lot healthier, great idea! I put in a Tbsp of mustard and some Turmeric powder, basil, so my seasonings are different but I'll have to try yours too. I haven't baked them, that would make them hold together a lot better for lunches.